PHOTOGRAPHS 2007 | TEXT 2014: I walked from Newcastle's Central Station past the eleventh century Keep and later Black Gate down to the Quayside. With the twenty-first century Sage building to my right high above the River Tyne and a range of nineteenth and twentieth architecture to my left I reached the Ouseburn. 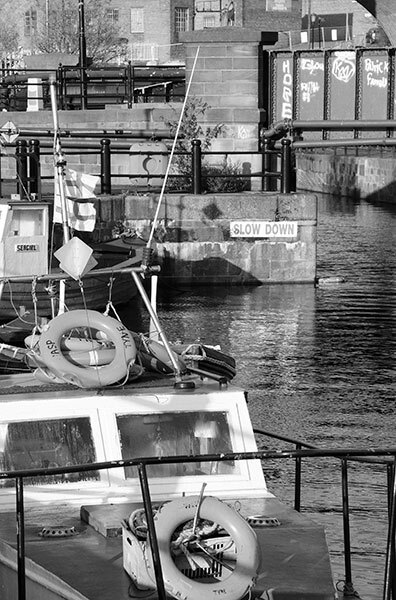 Small boats were moored close to the steel Low Level Bridge built in 1908. 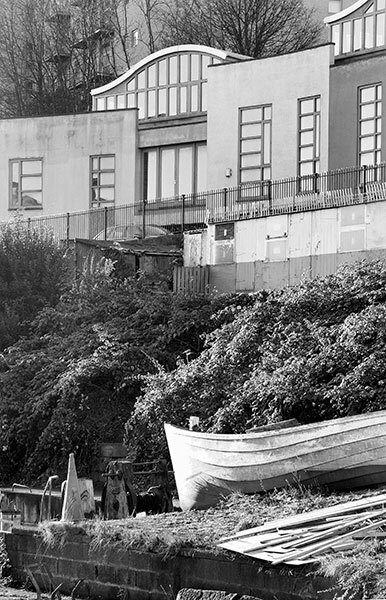 These boats had been lifted on to the quayside against the background of a sea-going ship moored on the south bank of the Tyne. It was delivering sand and gravel to a concrete making plant that has since been closed and almost completely dismantled. The Ouseburn village was once a dense mix of manufactories and housing developed along the river's steeply sloping banks. 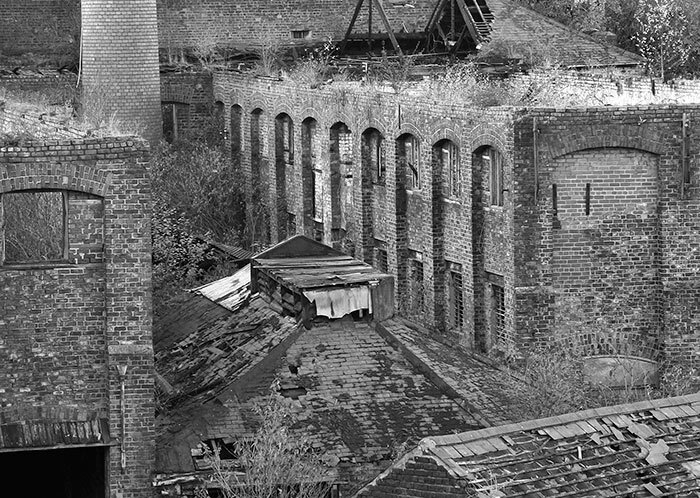 Grim and unhealthy, much of it had been cleared by the mid twentieth century to leave waste ground, new and cleaner industry but few houses. In 2013 the Campaign for Real Ale (CAMRA) voted The Free Trade the Tyneside Pub of the Year and it was reviewed by The Daily Telegraph in their ‘Guide to the best British pubs'. Its high setting gives long westerly views upriver to the City's seven bridges and beyond. The Low Level Bridge dates from 1908. A hump-backed single arch stone bridge occupied this site until the higher level and five arched New Glasshouse Bridge was completed in 1878. A little upstream a lock with vertical-lift gates was installed in 2009. Theoretically they can be operated to maintain a fairly constant river level in the Ouseburn whatever the tidal flows of the River Tyne. The utilitarian 1959 Ouseburn Bridge is an unremarkable replacement for an earlier single-arch stone bridge linking Cutbank and Byker Bank. 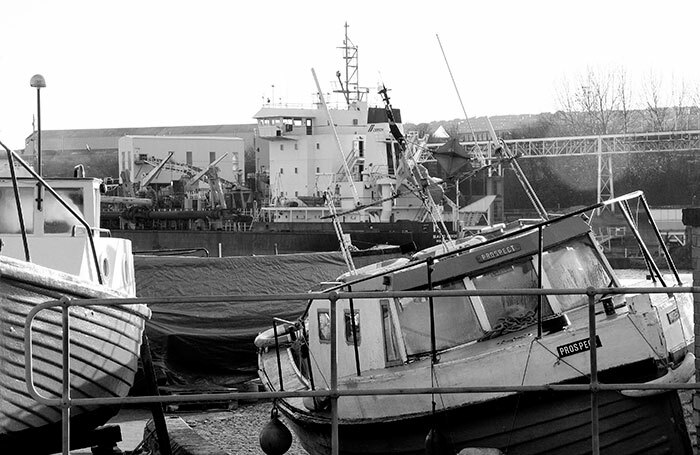 More boat moorings and a slipway lie beyond these craft grounded at low tide. 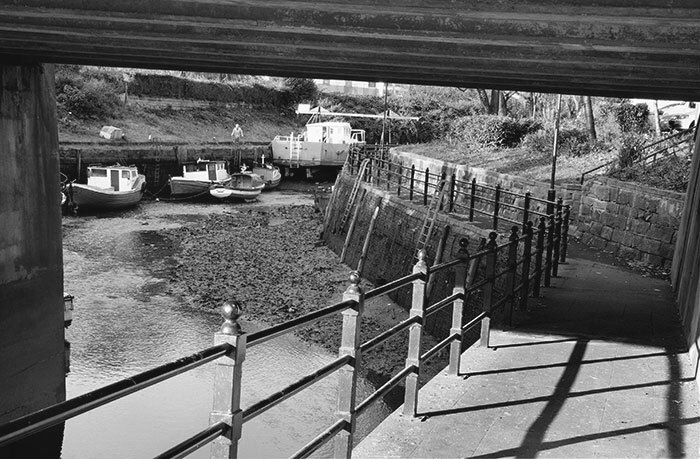 The river was dredged in the early nineteenth century and enclosed by stone quay walls. Wherries, a style of barge, moored to unload into carts drawn by horses up the slip to Lime Street. A few later twentieth century buildings stand along Lime Street overlooking boat moorings and a slipway. Various past redevelopment schemes have included business premises and student accommodation. 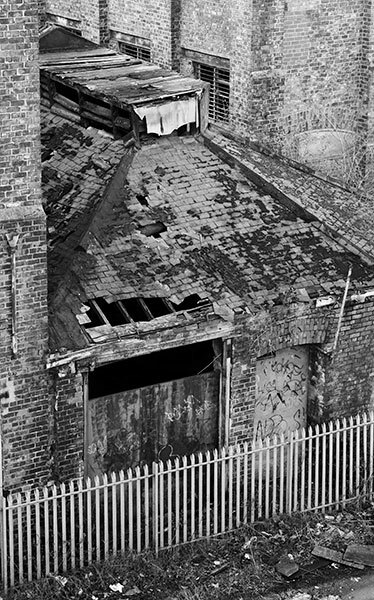 The name Lime Street records the early presence of lime kilns. The valley was home to a variety of changing industries including livestock yards, glassmaking, lead works, pottery making, metal works, granaries, flour mills and brickworks. As it's restored and developed for new and very different businesses domestic buildings will return after a long absence. This warm red brick building stands on rubble masonry set in turn on substantial dressed stone foundations: survival as part of the redevelopment seems very unlikely. 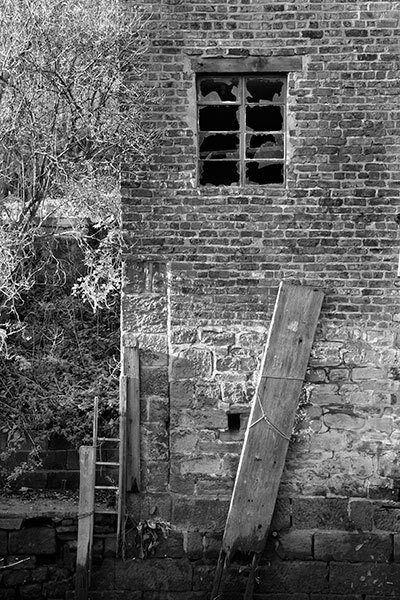 The ladder disappeared some time ago and the timber board has lost its lower water soaked section. Not evident here is the pleasing relationship between tree leaf green and weathered brick red. The National Centre for Children's Books occupies the restored (2005) seven storey Proctor Warehouse built c1870. It was used as a granary in conjunction with a flour mill housed in John Dobson's grandly designed flax mill of1848. 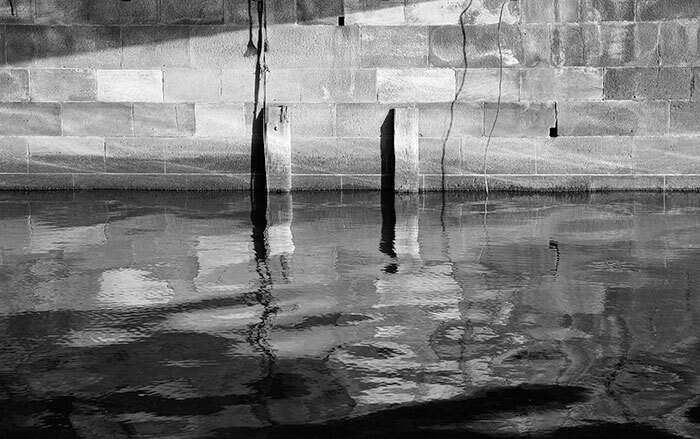 The curving façade echoes that in the river at its foot. The projecting canopy sheltered the hoist used to move grain and flour sacks to and from waiting boats. 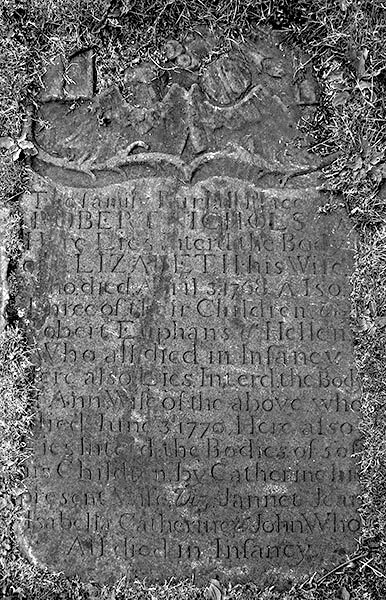 This cemetery for non-conformist believers was used from the early 17C to the mid-19C. Around 1930 it was landscaped and the headstones have been grounded as footpaths. The surviving inscriptions describe the family history and occupations of some of the interred. The name derives from the sailing ships' ballast off loaded along the Tyne before cargoes were embarked. Some memorials to church ministers stand upright alongside the flanking 19C Ouseburn School. The foreground bridge dates from 1982 and carries the North Shields line of the Tyneside Metro. 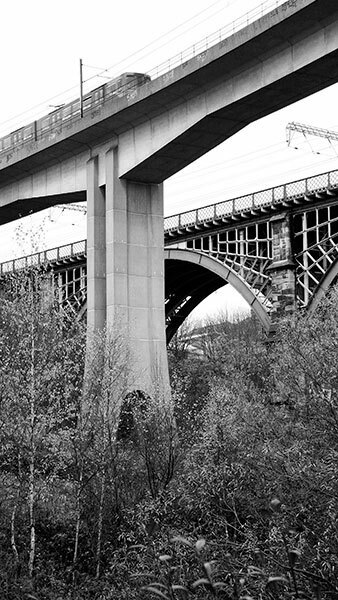 The 1839 Ouseburn Viaduct beyond was designed by John and Benjamin Green, perhaps better known as the architects of the Theatre Royal. Used by the Newcastle and North Shields Railway, its five spans set on stone piers were formed from laminated timber. In 1869 the bridge was doubled in width and constructed in iron to match the design style of the original. A full metalwork restoration was completed in 2014. The northern end of Lime Street is closed by the Ship Inn, the Byker Bridge of 1878 and the two railway bridges. 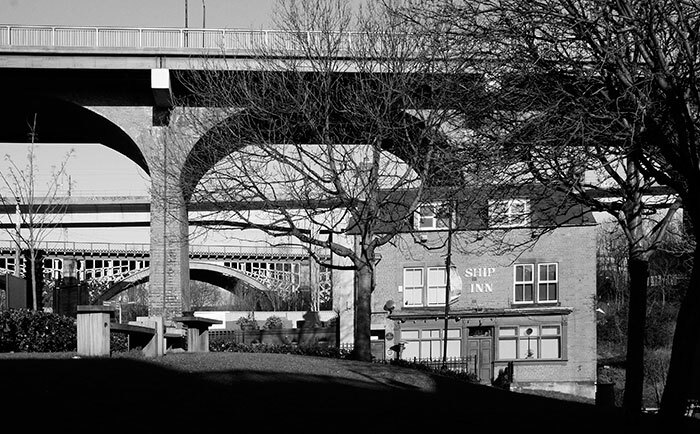 The Ship Inn dates from the early nineteenth century and is one of five Ouseburn pubs. The Cluny is across the street and the Cumberland Arms stands high on the other riverbank. 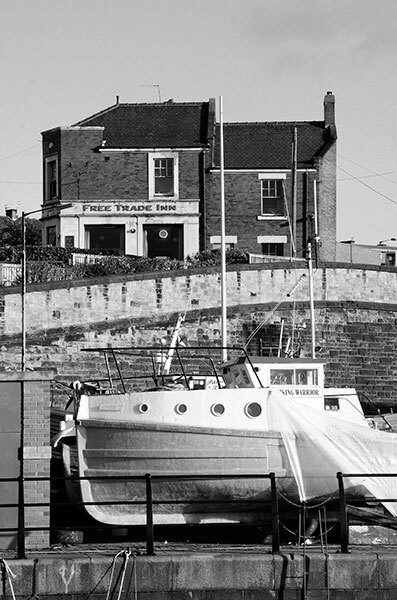 The Tyne Bar and the Free Trade Inn overlook its confluence with the River Tyne. 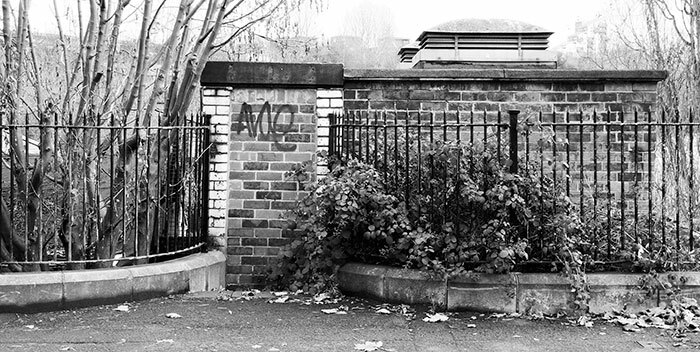 This small and long-closed public convenience stands alone, its rear façade overlooking the slipway down to the river. 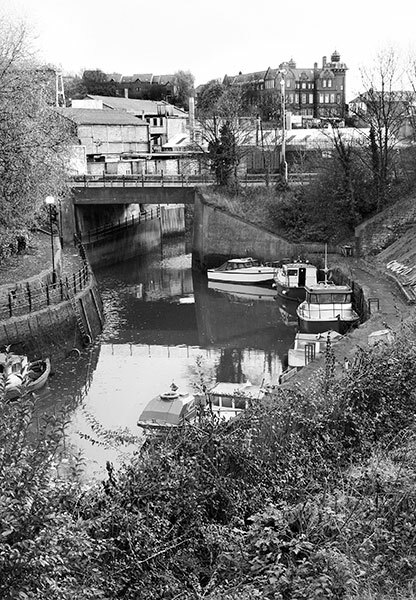 This view shows the Ouseburn at a roughly mid-tide sufficient to float the small boats moored alongside. 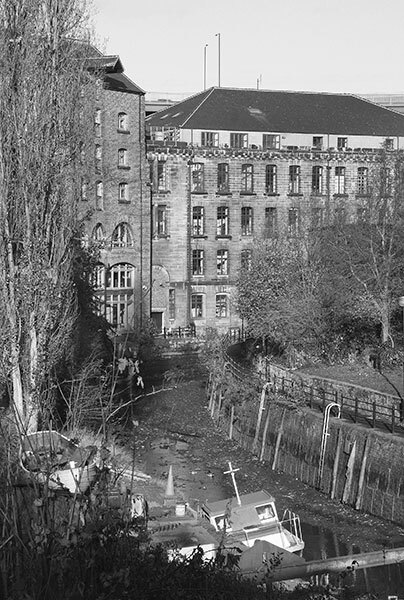 The building in Image 12 stands behind the camera position and the slipway is concealed by the vegetation. Some of the buildings in the middle ground below Ouseburn School have been cleared for apartment blocks under construction in 2014. The former Procter Warehouse stands behind the trees alongside the 1848 flax spinning mill. 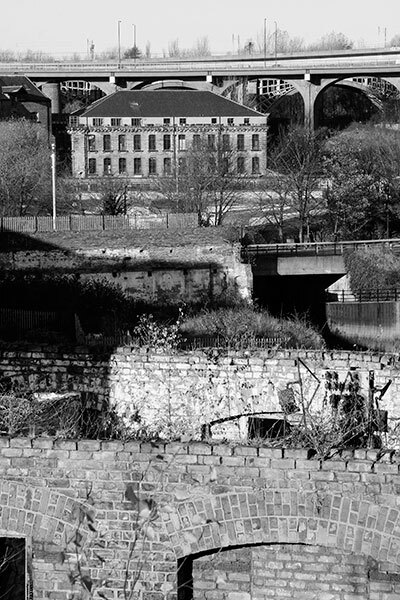 After later use as a flour mill the latter became a bonded warehouse for Cluny Whisky around1930. From dereliction in the1980s the five floors were gradually colonised and adapted as a co-operative venture, 36 Lime Street. Now this spacious building houses studios for some forty artists, photographers, designers and makers working in a wide range of disciplines. Each November they and other creative business in the wider area present the Ouseburn Open Studios Weekend. The Cluny operates there as a pub, café and live music venue. The foreground building dates from around 1880 and was first used in the livestock trade. It became a Maynards sweet factory in the early years of the twentieth century and operated as such until the late 1950s. Their retail shops around Newcastle survived until the 1980s. I recall black shop facades carrying MAYNARD in a striking typeface. The background building is 36 Lime Street. After the Maynard closure the building faced an uncertain future. An extensive fire in 1993 destroyed roofs and interiors: more than a decade of decay is record in this trio of images. 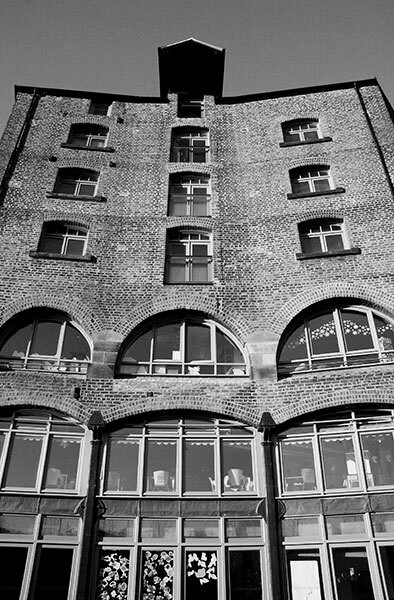 The U-plan building and the tall chimney have now been revitalised to designs by the Ouseburn based Xsite Architecture to become The Toffee Factory. The restored brickwork is accented by coloured panels and new structural details. It's a striking building inhabited by architects, designers, and digital businesses: a tour beyond the foyer would be interesting. The new Toffee Factory is the only survivor from the original range of buildings set on the riverbank between Glassworks Bridge and the upstream Ouseburn Bridge. Purple buddleia flourishes in a wedge of waste ground backed by the brick blind arcading of demolished buildings. ‘The Malings' apartment buildings are under construction (2014) across the river, named after the nineteenth century Malings Pottery. 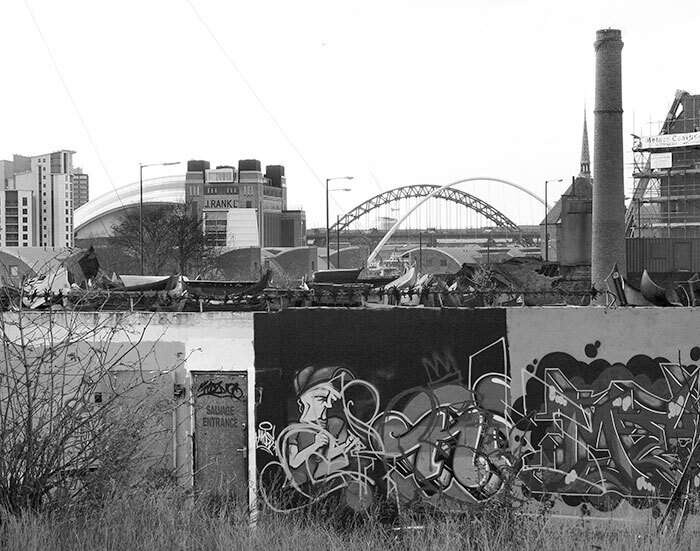 The Ouseburn area has been promoted as Newcastle's Creative Quarter. In 2014 the foreground buildings in this image still stand but not for long. In 2007 a garage repair business operated at the eastern end of the Glasshouse Bridge to the left of camera. Its structure was walled and roofed in corrugated iron resplendent in red rust and flaking paint. This is one of a long succession of spray paintings executed in varying degrees of creativity. The silhouetted objects on the flat roof are vehicle bodywork parts and mechanical discards.